Chances are pretty good that you or someone you know is wearing a piece of technology that is quietly collecting data. Things like Fitbits and Apple Watches monitor our steps, our sleep and even our calorie intake. We can then use that data to get healthier or understand more about our own bodies. Now, thanks to the Industrial Internet, utilities can do that exact same thing with the Electrical Grid. Wearable technology is part of the Internet of Things which, according to Gartner, is comprised of more than 4 billion connected devices including things like smartphones, Fitbits, smart thermostats like Nest and many new smart appliances such as connected refrigerators that sense when you need to buy more milk. These devices collect data and analyse it in ways that are making our lives more efficient and productive than ever before. The same thing is happening in the industrial world but on a much larger scale. As big as the Consumer Internet of Things is, the Industrial Internet of Things is bigger and it is growing twice as fast. It already has 20 billion connected devices generating massive amounts of data. Many industries are starting to use that data to save money and time. Power plants, for example, that have tapped into the power of the Industrial Internet have found that by improving efficiency by as little as 1 percent they can save $66 billion over 15 years. This massive collection and analysis of data is going to fundamentally transform the way utilities operate. When something goes wrong, utilities typically need a physical inspection to locate the problem. But if you add sensors to plant equipment to collect data about the state of everything from pole top transformers to power lines, to meters, you can gather and process that data to get an unprecedented look at the power network which can help limit down time, reduce unplanned outages and operational expenses. It is estimated that utilities could achieve $160 billion of financial benefits from smart meter installation alone. These remote sensors will improve operational effectiveness, but also provide insights to capital asset planning and prioritization. Ask utility executives what one of their biggest concerns is and they will cite aging infrastructure. Outages due to electrical faults and insulation degradation from aging assets can cost a single utility more than $30 million annually. For years, the generation, transmission and distribution business has only been able to monitor its most expensive equipment — generators in power plants and transformers and circuit breakers in transmission substations. That approach left the industry with a blind spot that undermined reliability. Now power inverters, smart meters, pole-top transformers, cables and even poles can be tracked on the Industrial Internet giving the clearest picture yet of the state of any given network. Remote sensors provide data that can be used to not only monitor current performance, but support prognostics that help identify potential failure in the future. That data collection and analysis can spread to some surprising places. Imagine sensor-enabled streetlamps providing data about local environmental conditions like humidity and temperature and the condition of the lamp. If you combine that with outage status information collected from smart meters and sensor-enabled pole-top transformers, utilities would actually be able to pinpoint the exact location of an outage and deploy repair crews accordingly. All of this could be done without even having to do a damage assessment inspection first because the utility would know exactly what happened where. The result? Complete Asset Performance Management, faster power restoration, less down time and lower costs. We're only just beginning to scratch the surface of the potential of the massive amount of data that will be collected by the Industrial Internet. By 2019, devices connected to the Industrial Internet will create 80 exabytes of data. (Just 5 exabytes equals all the words ever spoken by human beings in the history of time.) That's too much for any utility to process, but just as consumers harness the combined computing power of Google, Facebook, Apple and Amazon in their daily lives, utilities can manage and interpret their growing flood of data by embracing the power of the cloud. 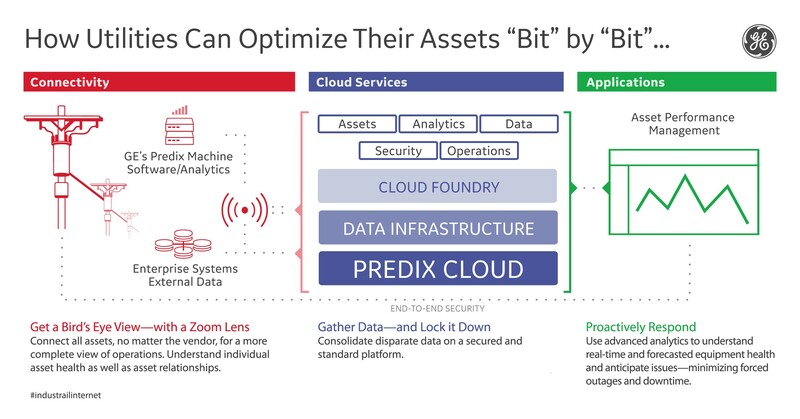 GE's cloud-based operating system Predix is designed to address the unique strength, scale and security requirements of industrial data. Just like Apple's ecosystem, it's open for developers to create innovative apps on top of it. The Asset Performance Management suite of solutions is specifically tailored to give utilities the tools they need to harvest and analyze data supporting the entire life cycle of the asset. The software makes sure that large numbers of connected assets don't break unexpectedly, causing costly downtime. 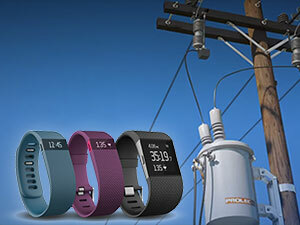 Just as personalized data gathered from things like Fitbits will help make us healthier people, analysis of data streaming from the Industrial Internet will create a healthier grid. And a healthy grid is one that runs efficiently, with less downtime and less money going to costly repairs. To discover more about the challenges of modernizing the Grid, please visit us here.